I made chili last night that was very yummy! I am not a big chili person but my hubby is! He really liked it although he said he would omit the corn next time (personally I really liked the corn in it). My 7 year old really liked it too! Here are all my ingredients: Brown meat, drain grease. Put in crock. If you have this cool Pampered Chef gadget then you’re cool like me LOL! If not have fun with your spatula. Add Frozen Corn and rinse. It says to thaw corn first. I didn’t bother and it didn’t matter. Chop onions. I can’t live without my Pampered Chef Food Chopper. If you haven’t noticed I’m belong to Pampered Chef Anonymous LOL! See how nicely it chops! Combine all together in crock pot. Set to low. See how pretty it look! YUMMY! Full Recipe can be found here, if you haven’t signed up for their FREE (yes, free) quarterly magazine then also click here!! Let me know if you give it a try to what you thought of it! BROWN meat; drain. 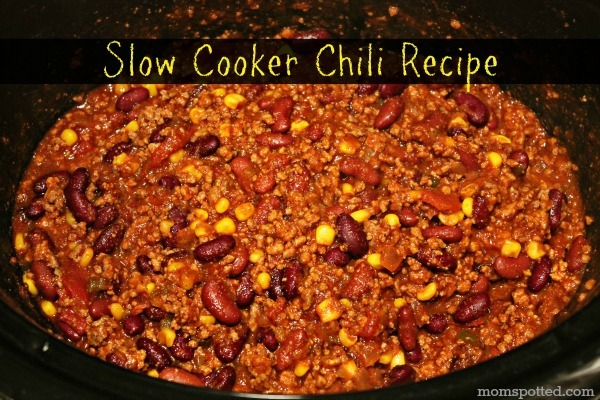 Add to slow cooker with remaining ingredients except cheese; stir. Cover with lid.COOK on LOW for 5 to 6 hours (or on HIGH for 3 to 4 hours). I have never seen corn in chili like that before – adds some nice color! I am not a big fan of corn in my chili, but i used a can of creamed corn once by accident, and it was perfect! It would be worth a try.